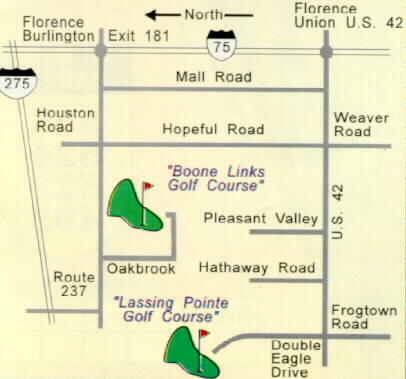 Welome to Lassing Pointe Golf Course in Union, Kentucky. Lassing Pointe is a truly challenging golf course designed by Dr. Michael J. liurdzan. It will test your ingenuity and competitive spirit as well as your shotmaking ability. The golf course was designed with many strategic options which will provide a stimulating golfing challenge and a fast-paced round of golf for all levels of golfers. Please replace divots, repair ball marks, rake bunkers, and keep golf cars on the path at all times. We are very proud of our beautiful golf course and request your help in maintaining it in excellent condition. Thank you for your consideration, and if Lassing Pointe isn't available for your round of golf, please call Boone Links at 371-7550. Old Fashion Service, Today's Technology! Copyright � 1996 - 2002 Mike Parker Real Estate, LLC. All Rights Reserved.